On August 2, we went to a pool party at our friend Leslie's. Leslie's dog, Cashmere had a great time playing in the pool with kids and the adults enjoyed catching up. We got our gear organized and kayaked across Tomales Bay for about two hours to the northern Pt. Reyes Penninsula - in the Tule Elk preserve. We have hiked there numerous times but this is the first time we have gone there by water. We passed Hog Island and were amazed at how shallow most of the bay is. When we landed on Pt. Reyes, we took a walk along the beach to see Jellyfish and other marine life, had a picnic prepared by our guide and naturalist, Mike, and took a hike up on the penninsula to see the Tule Elk grazing with the bulls protecting their herd. After lunch, Mike led us on a hike up to see the Tule Elk. We ended up at the same spot where we hike in to see the elk. Mike's knowledge of the elk - after observing them for 10 years, made the trip very special and informative. In addition to the elk, we saw rabbits and grounhogs. 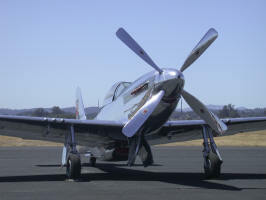 On August 23, we attended the Santa Rosa air show, Wings Over Wine Country 2003. 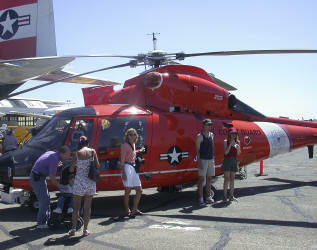 This was our second visit to the annual event. Our first was two years ago with our niece Mallory. 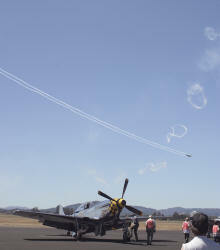 It proved to be a similar event with parachute jumpers, Air Force fighters and aerobatic displays. 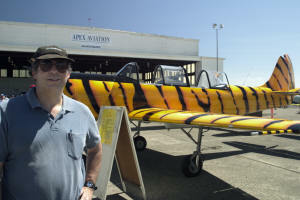 On the ground we checked out the new general aviation planes, emergency aircraft (Reach, CFD, etc) and vintage planes both military and general aviation. 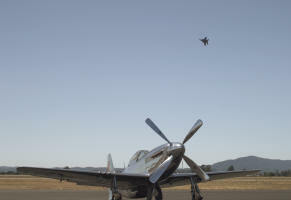 It was a nice day for flying which is what Jon did after leaving the show.